The “Viking” is a reality. After almost a year from concept to completion the new horseshoe can be pitched in all NHPA sanctioned tournaments. I will begin pitching the Viking on August 1st at the “Boss Hoss Cycle Toss” in Frederick, Maryland. The officers of the NHPA reviewed two of my horseshoes on July 26th just before the beginning of the World Finals in Springfield, Illinois. In addition to the NHPA approval, I also received a U.S. government copyright for the design. I initially sent two different horseshoe designs to the NHPA. The Viking was accepted and the Cyclops was rejected. The Cyclops was rejected because it was 1/8″ too wide. An easily corrected problem, however, I was in the process of making a change to the hook caulks to add a little additional weight. Herewith the Viking. You may notice that the name is the “Hammer.” The NHPA suggested that I change the name to avoid possible confusion since there was already a “Hummer.” Therefore, I renamed the horseshoe the “Viking.” The copyright was submitted under the name “Hilfling Viking.” Hilfling Horseshoes being the company name should I decide to go into production. My goal has always been to design a horseshoe for the flip pitcher with design characteristics that reduce, if not eliminate bounceback. Secondly, I wanted to make a shoe that helped the Elder, Woman or Youth pitcher. That meant light, well balanced and easily gripped. So, the horseshoe weighs 2 pounds 6.5 ounces. The thumb caulk is pronounced and has a prominent thumb notch. The weight of the shoe is biased toward the hook caulks by 3/16″. This allows for early rotation, without requiring a flip move with the hand/wrist. The mathematics of the Parabola was used to calculate the inner surface of the Viking, as with all of my designs. The mathematics of the parabola is used to design a satellite dish. No matter where the signal hits the inner surface of the dish, it will bounce to the same focal point. This is the same logic that is used to design the inside arc of the horseshoe. 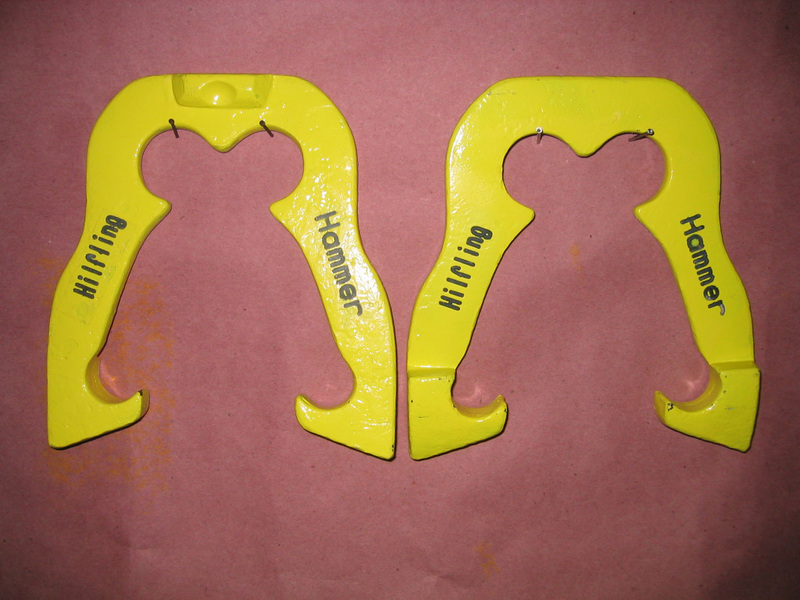 The theory is that when the horseshoe hits any location about 1″ above the hook caulk, on the inside of the horseshoe, will be deflected toward the two catches to the left and right of the ringer break. If you miss either side, the ringer break will also deflect the horseshoe left or right into the catches. Hitting the stake just above the hook caulk will cause the shoe to be rotated and grabbed by the hook. The tabs to the left and right of the ringer break perform two functions. First, they deflect the horseshoe to the left and right catches. Secondly, they are positioned so that they can support the index and middle finger of the gripping hand. This offers several possibilities for hands with small fingers. I happen to have small fingers and use the right catch for my index finger and the left catch for my middle finger. The ring and little finger supports the underside of the left shank. For added support, you can place the index finger under the right tab and the middle finger under the left tab, or, one or the other. Below is an example of the most traditional method of gripping the Viking. This grip will encourage an early rotation of the shoe and eliminates any flipping action on my part. The grip below adds additional support by bracing the shoe with the index finger supporting the shoe on the right tab. You can also support the shoe with the middle finger under the left tab. Either grip will cause the rotation to slow down, which helps for single flips from longer distances. The grip below adds the maximum support with the index finger under the right tab and the middle finger under the left tab. This grip creates the slowest rotation of the available grips. This grip will help when throwing from 40 feet. Even though I designed this shoe for flipping, several of my Monday night league members have successfully turned the Viking. Traditionally, shoes designed for turning have all caulks on one side. Interestingly, each turned differently, one 3/4, one 1-1/4, and one 1-3/4. I have just completed the purchase of the Casio FC100, a high speed camera with a built in slow motion and 1,000 frame per second recording speed. I intend to study the reaction of the standard horseshoe against any of my designs, in high speed slow motion. It’s one thing to make claims, it’s another to prove them. I’ll be placing the results on YouTube. A new video showing the Hilfling Viking is now posted on YouTube. Check it out. The Hilfling Viking on YouTube recorded at 420 frames per second. Watch how the stake is deflected at impact. Notice how the tab deflects the stake and rebounds into the catch. Check out Part 2 at 420fps. NOTE: Two more prototypes have been released for casting. I am expecting the cast versions to be delivered the week of 17 August. Both will undergo high speed camera testing.